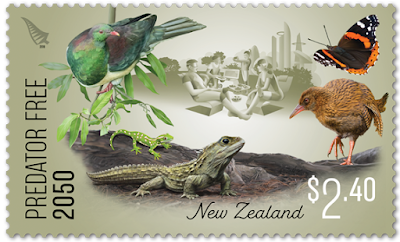 Virtual New Zealand Stamps: 2018 - Predator Free 2050. Predator Free 2050 is the ambitious goal to remove key mammalian predators from the New Zealand landscape by the year 2050. This effort involves central and local government, iwi, conservation trusts and philanthropists. 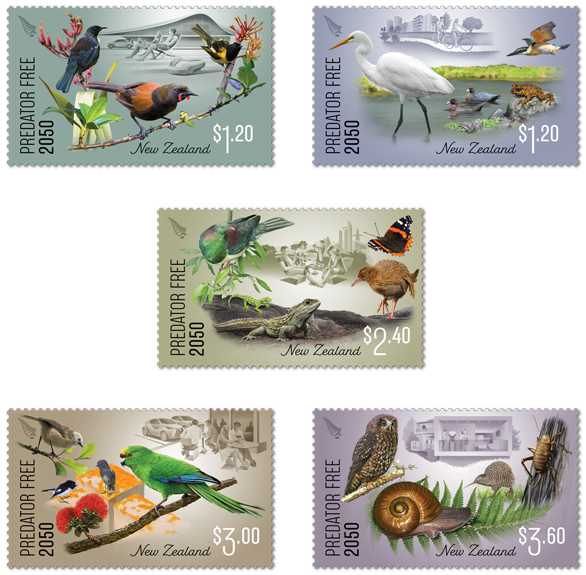 Predator Free New Zealand Trust (PFNZ) is one of those organisations, working with community groups, schools, marae, neighbourhoods and businesses to ensure our precious native species can flourish for generations to come. New Zealand is an isolated island nation where many amazing animal species have evolved in the absence of mammalian predators. However, the introduction of species like rats, stoats and possums has resulted in the endangerment and extinction of many native birds, lizards and insects. Despite its reputation as an environmental paradise, New Zealand has the highest percentage of threatened animal species in the world. 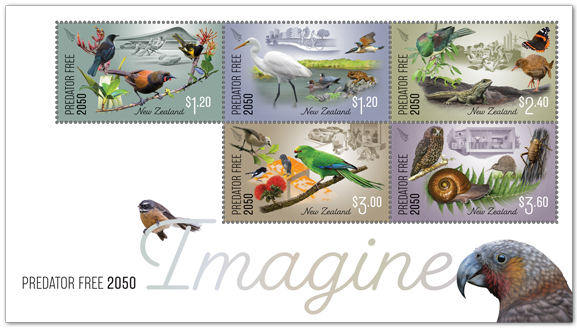 Over 80% of our native birds are at risk. Alongside large-scale eradication projects led by local and central government, PFNZ is supporting local communities, iwi, farmers and businesses to help in the effort to rid New Zealand of key mammalian predators by 2050, so backyards everywhere will be teeming with native wildlife for generations to come. This is a great goal to strive for and if we all get involved it could be achievable. So the question we should be asking is not "Can this ambitious scheme be achieved?" but rather "What can I do to help achieve it?" As the manager of a nest of farms, I have control over a large area of farmland, pine forest and native bush. Besides our role of fencing off and planting along waterways, for some years now we have been involved in an eradication program to remove unwanted pests and plant groups of native trees in areas not suitable for grazing. This is already showing signs of increased native bird life in many areas. Our goal - more environmentally friendly farming. 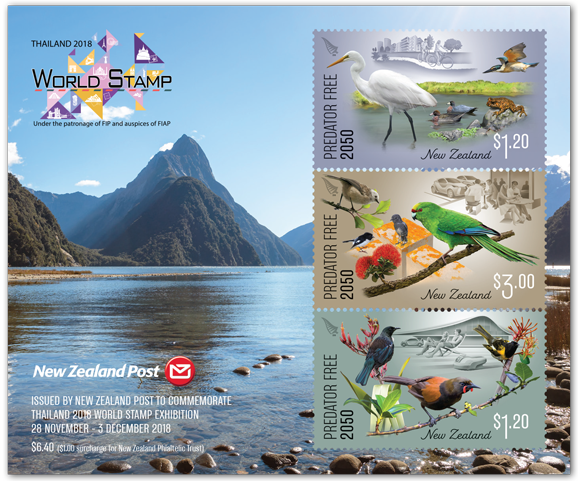 The five stamps show us a predator-free environment where native wildlife are now safely living where they can be enjoyed by humans. 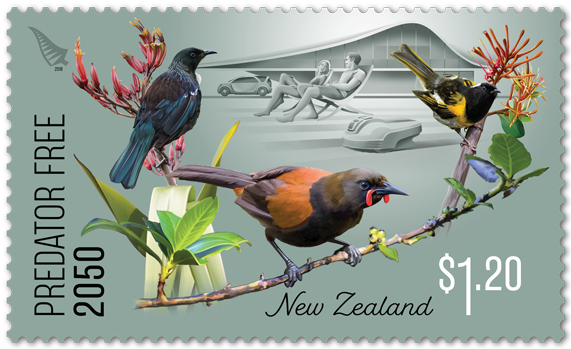 In each design, the native birds and other wildlife take prominent place while the humans are shadowed out in the background. Once again NZ Post has produced an attractive set of stamps with a worthy message. Neighbourhoods with backyards teeming with native species, where sounds of the tūī, hihi (stitchbird) and tīeke (saddleback) create a melodic dawn chorus, would be idyllic for most New Zealanders. The tūī thrives on nectar from flowering flax and kōwhai and is distinctive with its white throat tuffs. The hihi and the tīeke are both on the endangered species list. These wondrous birds won’t proliferate without the removal of predators like stoats, rats and possums. Imagine cycling through thriving wetlands and busy rivers on the outskirts of a city, each alive with kōtuku (white herons), whio (blue ducks) and kōtare (kingfishers). Most New Zealanders won’t see a whio or kōtuku in the wild as both are endangered and only found in areas with low predator numbers. The whio, which is named after the sound of the males’ call, is well known for being printed on the $10 banknote. The Hochstetter’s frog is one of four native New Zealand species. Enjoying the outdoors is a popular pastime for most New Zealanders. You might hear the distinctive wing flap of kereru (wood pigeon) flying low overhead or find weka pecking at your feet trying to steal your bootlaces. Imagine a predator-free New Zealand where you could also share your local park with the ancient tuatara, the jewelled gecko or the kahukura (red admiral butterfly) - one of many butterflies and moths that are endemic to New Zealand. 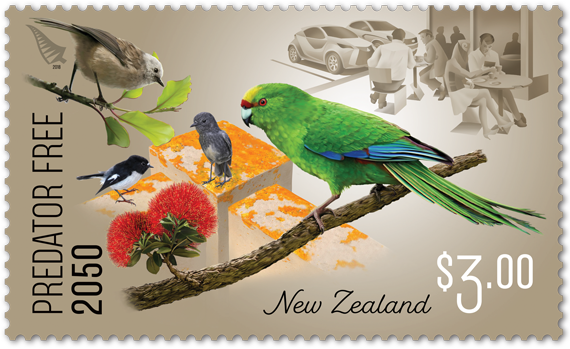 Imagine an outdoor urban cafe where the most prevalent birds, visible in the nearby pohutukawa, are New Zealand’s unique native species - the popokatea (whitehead), miromiro (tomtit), toutouwai (North Island robin) and Forbes’ parakeet. Imagine these beautiful birds being so well established in cities and towns that our children were familiar with their names and calls. Popokatea, miromiro and the friendly toutouwai can only be found in forests where predators’ numbers have been reduced, while Forbes’ parakeet is high on the endangered list. The nocturnal wildlife in New Zealand is as impressive as the creatures that come out in daylight. The great spotted kiwi, one of five species of our iconic flightless bird, is at constant risk of predation. The ruru (morepork/owl) can be found in urban environments all over the country where its haunting, melancholic call echoes in the night. Among the heaviest insects in the world, giant weta are also the largest of the weta species. 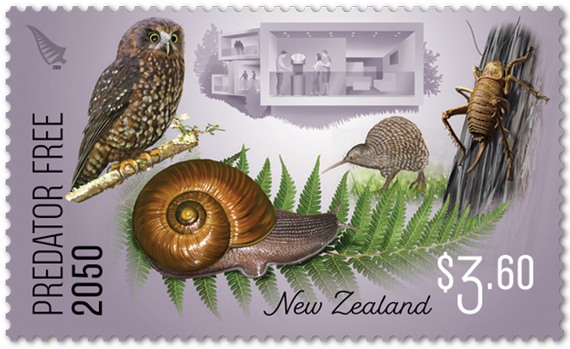 And New Zealand's spectacular native giant snail (Powelliphanta) is carnivorous, feeding mainly on native earthworms. 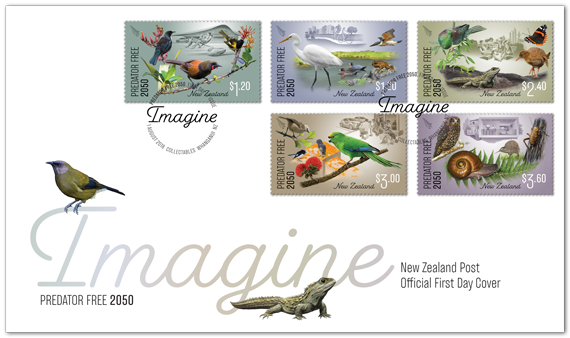 The miniature sheet features the kākā and the pīwakawaka (fantail). The first-day cover gives you a closer look at the majestic tuatara and the korimako (New Zealand bellbird). 2018 Predator Free Miniature Sheet. 2018 Predator Free First Day Cover. 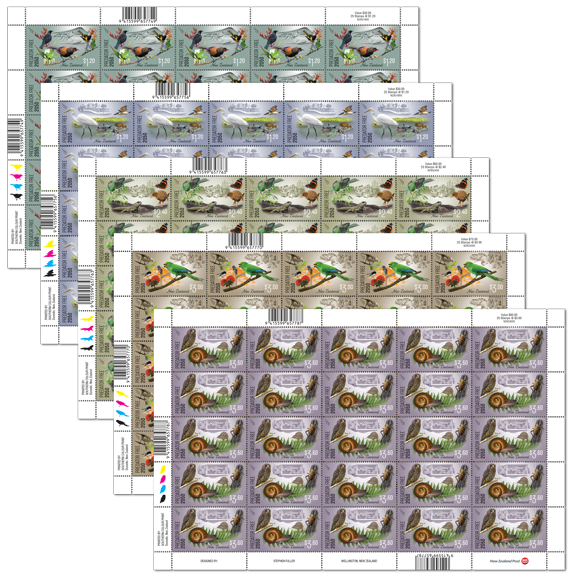 2018 Predator Miniature Sheet Free First Day Cover. 2018 Predator Free Plate Block Set. 2018 Predator Free Value Block Set. 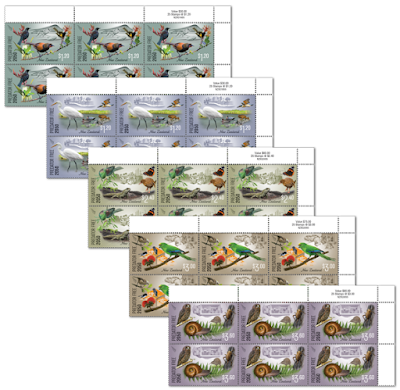 2018 Predator Free Full Sheet Set. 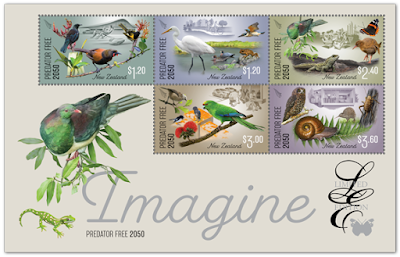 Read more about the predator-free movement and the endangered species being brought back from the brink of extinction with words by Jessi Morgan of PFNZ, and beautiful illustrations by Wellington artist Stephen Fuller. This pack along with other items shown here are available for purchase through the NZ Post website via the link at the bottom of this page. Sir Rob Fenwick is co-founder and Chair of PFNZ. 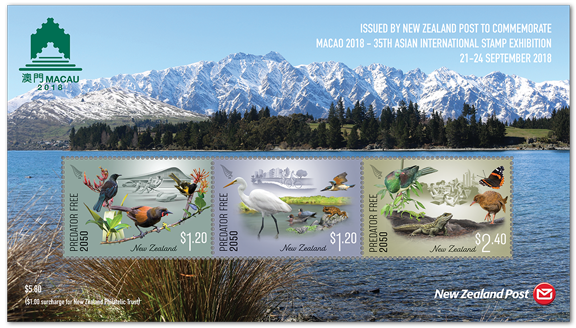 Sir Rob also chairs The Kiwi Trust which runs Kiwis for kiwi, a charity working to save our iconic kiwi bird from extinction through targeted programs on private land. 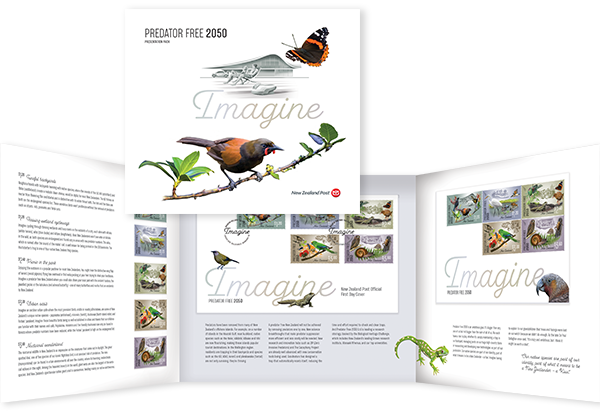 In this special pack, the full set of Predator Free 2050 stamps can be seen in even more depth and detail, with commentary provided by Sir Rob. 2018 - Macao 2018 Exhibition. 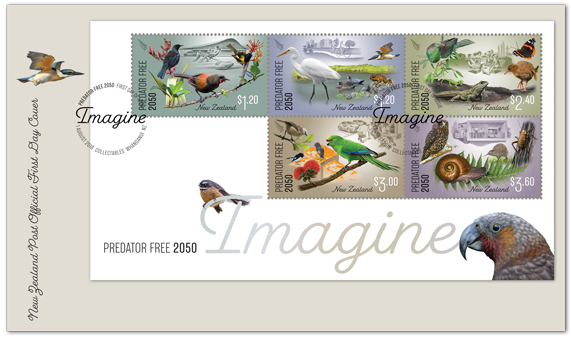 One of the miniature sheets issued for sale at this exhibition featuring 3 stamps from the 2018 - Predator Free 2050 issue. Date of issue: 1 August 2018. 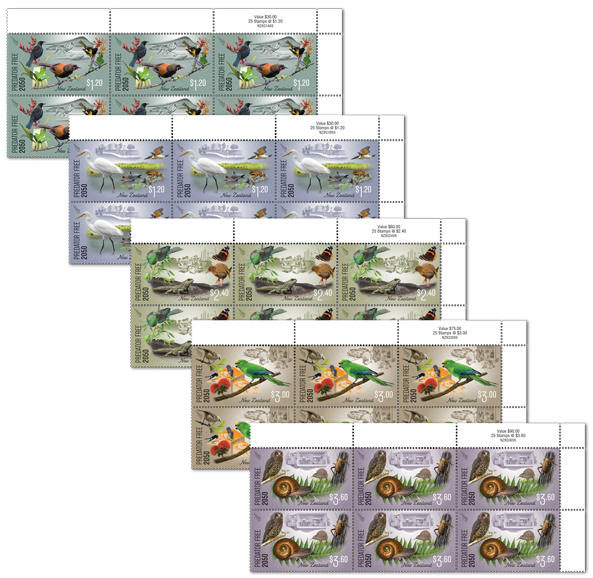 Number of stamps: Five gummed stamps. Denominations: $1.20 x2, $2.40, $3.00, $3.60. Stamps, miniature sheet and covers designed by: Stephen Fuller, Wellington, New Zealand. Printer and process: Southern Colour Print Ltd, Dunedin, New Zealand by offset lithography. 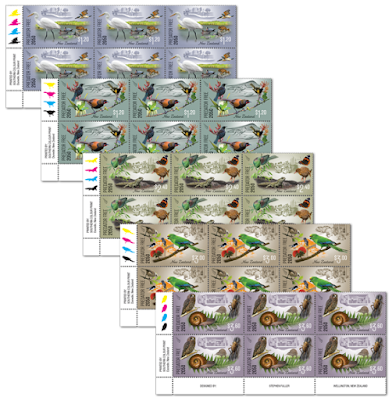 Stamp size and format: 50mm x 30mm (horizontal). 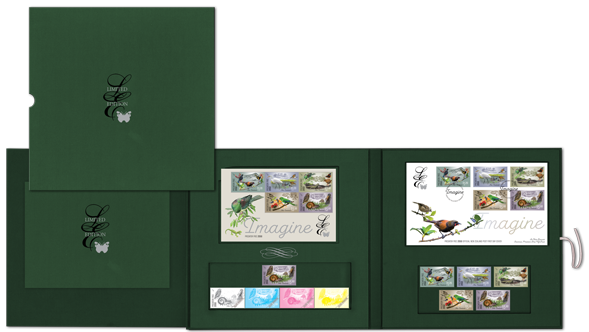 Miniature sheet size and format: 170mm x 108 (horizontal). 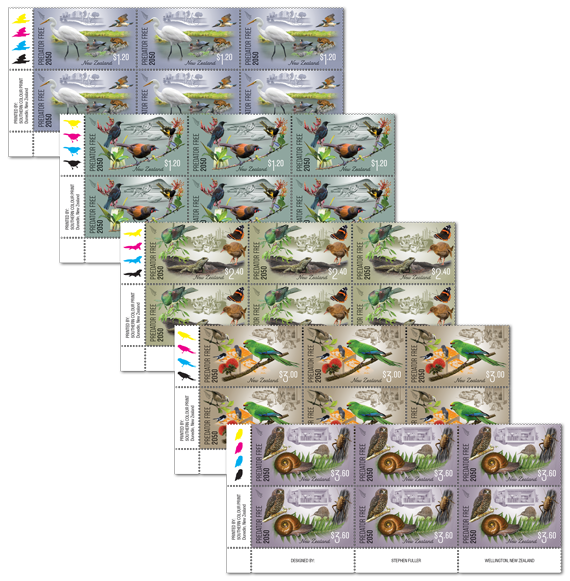 Period of sale: Unless stocks are exhausted earlier, these stamps will remain on sale until 31 July 2019. First Day Covers will remain on sale until 2 October 2018. 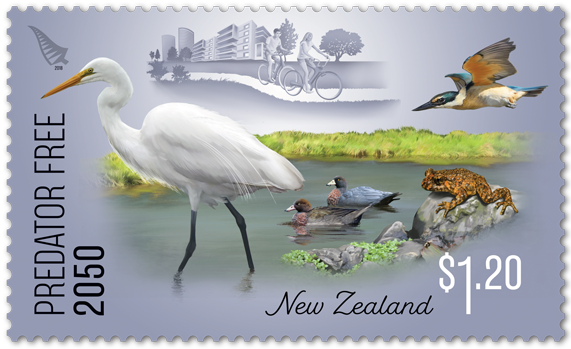 These are such good stamps. So much in them and a powerful message behind the issue too. Is this ideal achievable?